Story Corps is “an independent nonprofit whose mission is to provide Americans of all backgrounds and beliefs with the opportunity to record, share, and preserve the stories of our lives. Teachers can incorporate content from the Story Corps site into the oral skills classroom. 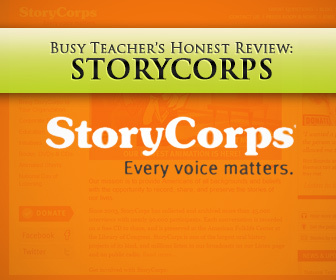 Teachers can incorporate content from the Story Corps site into the oral skills classroom. The diverse and extensive collection of interviews available is a wonderful resource for meaningful listening material that students can connect with on a personal level. Given what we know about the importance of taking into consideration the affective features of our students, using Story Corps is a wonderful way to get students to connect with listening samples on a far deeper level. The “Introduction to Story Corps Lesson Plan” is a downloadable lesson plan that teachers can customize for students at the secondary level. It includes 2 activities that include opportunities for one-on-one and group discussion. It’s not intended for the ESL or EFL classroom, but it can absolutely be used in one. Students are asked to participate effectively in a variety of interactions (one-on-one and in groups), which will work great in any oral skills classroom. While not intended to be used as an ESL website, or even a language-learning website of any kind, Story Corps is dedicated to helping use see our shared humanity and to build connections. Certainly, in our own work as English Language professionals, we understand the value of connection, particularly across diverse audiences and cultures. The mission of Story Corps is a natural fit with the goals of most English a s Second/Foreign Language teachers in our pursuit of helping students to develop communicative competence. Furthermore, the cultural component offered by Story Corps can be a valuable tool for ESL and EFL teachers seeking to help their students connect with American culture. Story Corps provides the opportunity for teachers to try something new. Using the interviews on the site, instructors can take a content-based approach to learning, weaving personal growth into the English language classroom, something most of us forget to do, at times. When I have used Story Corps in the classroom, I’ve always learned more about my students than I ever expected. It really humanizes our learners, and brings a depth to the English as Second Language classroom that can at times get lost. Anytime instructors choose to use a resource in the English as a Foreign Language classroom that is not intended for ESL teachers, there is, of course, more work involved on their part. This is not a site that will be used for quick “filler” type lessons; it’s definitely something that has enormous potential, but teachers will need to do some careful planning to really get the most out of all that Story Corps has to offer. It’s probably a site that will better serve intermediate and advanced students, and those with high levels of motivation. It requires a mature student to get something out of both listening to and creating interviews of a highly personal nature, but for those who are willing, Story Corps presents a wonderful opportunity for students to grow, not only as English speakers, but also on a personal level. If you’re up for trying something really different in the English as a Foreign Language classroom, I’d highly recommend that you investigate all that Story Corps has to offer. This is a site that can be used just once or in-depth throughout the course of a semester. How teachers choose to integrate the resources available on this site should be determined by the level of proficiency and perhaps more importantly, the maturity level of students in a given class. Those students who are highly motivated and engaged will undoubtedly benefit most from this, and likely find it personally enriching. This can greatly enhance the overall language-learning experience, and perhaps remove some of the focus and anxiety from the language task at hand, giving students an opportunity to really engage with topics while unknowingly acquiring language. In many ways, I think the use of Story Corps has the potential to create a very natural learning context as students think about themselves as members of society. The cultural benefits are huge, and Story Corps can greatly enhance students’ knowledge of American culture, challenging some of their preconceived notions and opening their eyes to things they were unaware of. Truthfully, this may also happen for instructors as they use Story Corps, which is an extra added bonus to incorporating the site into the classroom. If anyone has tried using Story Corps, I’d love to hear what the experience has been like and in particular how students have responded to the stories.